In reality, it is nothing short of a bold lie, as part of an extremely deceitful marketing campaign! The very event being sold as a miraculous proof of how effective Yusuf Estes is in calling to Islam is actually a nasty concoction of deception and trickery. 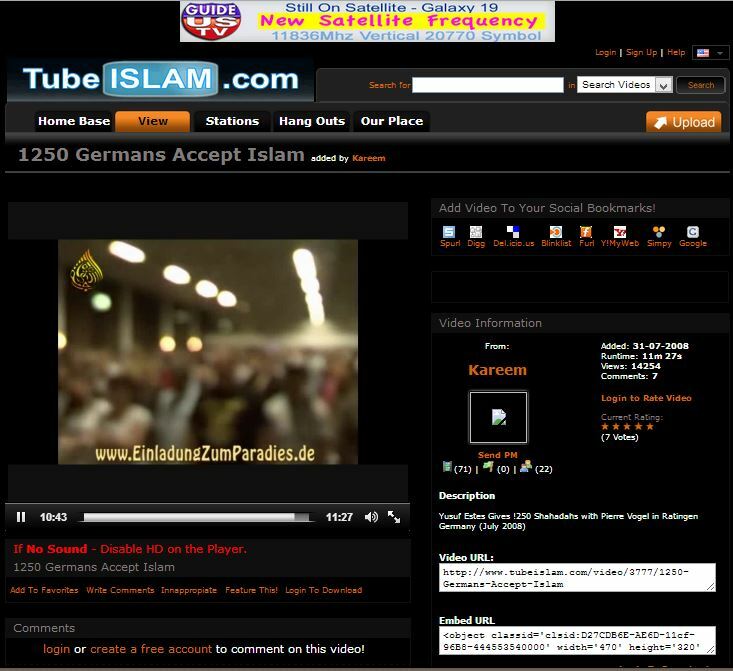 People view these videos and witness an entire tented lecture hall of Germans repeating the shahadah after Yusuf Estes. And it seems very convincing. But is it real? Did you know that every person who wants to be Muslim needs to make shahadah? Even if you were born in a Muslim house, with a Muslim name, it still applies to you like it applies to anybody else, just like salat [prayer], fasting, zakat, and Hajj. So, each and every one of you – even though you said: Well I say the shahadah in my salat [prayer] all the time – but if you never made a public shahadah, why not do it right now? Source: This video on YouTube [alternatively this one] at six minutes into the video. This is the first level of falsehood and deception. To be absolutely clear, Islam does not require any “public shahadah” ceremony from any Muslim, whether new or born Muslim, not individually, and not as part of a group. As Islam is a Religion of brotherhood and community, it is nice to hear of new Muslims accepting Islam. However, it is not a requirement, nor is it even recommended, let alone a pillar of Islam [! ], to have a new Muslim pronounce his shahadah in front of a large public gathering. It should be noted that this is commonly done by da’wah organizations as a fundraiser or to attract the media as a marketing tool. Little attention is given to the individual and his situation, who may be genuinely embarrassed to stand in front of a crowd, or at least not prepared – on his first deed in Islam – to announce his decision to the masses. A new Muslim typically faces a lot of pressure when changing his religion. Do we really want to add more pressure and difficulty on him by requiring him to be involved in some contrived public ceremony? Care and concern for the welfare of a new Muslim is sacrificed to focus more on da’wah organizations and their marketing mechanisms. 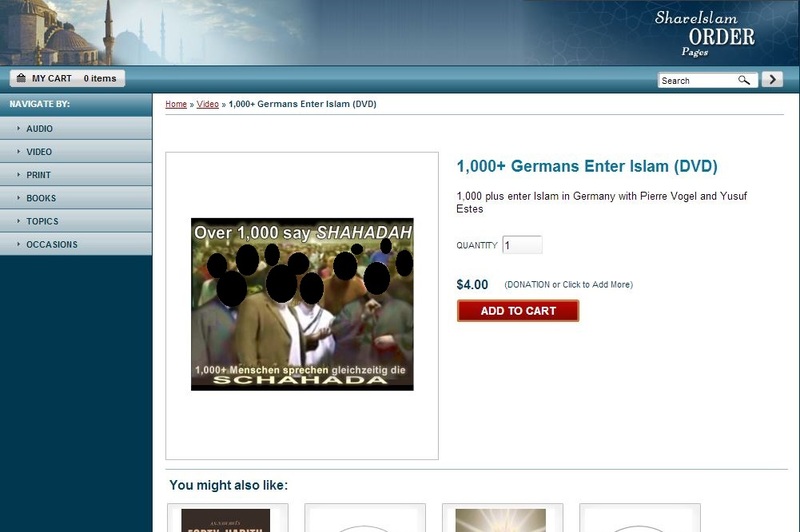 The third layer of this deceptive scandal includes moving from the report of 1,250 Germans “taking their shahadah” into 1,250 Germans “accepting Islam”, as found in many of the video titles quoted above. The fourth layer of deception involves taking the contrived event and its misrepresented summary to an international stage and into other languages, especially Arabic, the language of the biggest funders of the Yusuf Estes mission. But is Yusuf Estes Really Involved in the Deception? [Estes] In 2009, that was in August of 2009. I was a guest there for some of the organizations. And on our last event, we had about 1,300 people who attended, and they were very, very impressed with what is real Islam. And approximately 1,250 – remaining only 50 left – but 12,550, uh, uh, twelve hundred, sorry, 1,250, they stood up and they made their shahadah all together all at the same time. [Interviewer] You told me you was very tired, every few minutes and another group comes, yes…? [Estes] What happened, yea, when we finished the program, Pierre Vogel, he was saying salam to the people, and I said: ‘Well, wait a minute! Ask them if anybody would like to accept Islam?’ And he said, in German, he, you have to make tarjamah [translation] into German. And then he said: ‘Who would like to accept Islam?’ One man came up, a wrestler, he accepted Islam, then another man, one-by-one, each time he [Vogel] would say salam [i.e. goodbye] I said, “No, no, ask who’s next? Who’s next?” And then finally some women started coming up. I said, “OK, wait. Let’s just ask how many in the crowd would like to stand up, and you don’t have to come out on the stage. Where you are, make shahadah.” And all stood up , and we said, “Sit down if you don’t want to be a Muslim. Don’t stand up just for this. Sit down if you don’t want to be a Muslim. Only stand up if you want to be a Muslim.” So, 50 people sat down, remaining: 1,250. Source: Interview with Yusuf Estes on Almajd TV [available alternatively here or here] Remember that this was on a live satellite TV channel broadcast all over the Middle East. Almajd TV is a free channel reaching millions, and it is part of a network of channels with hundreds of thousands of paid subscribers as well. 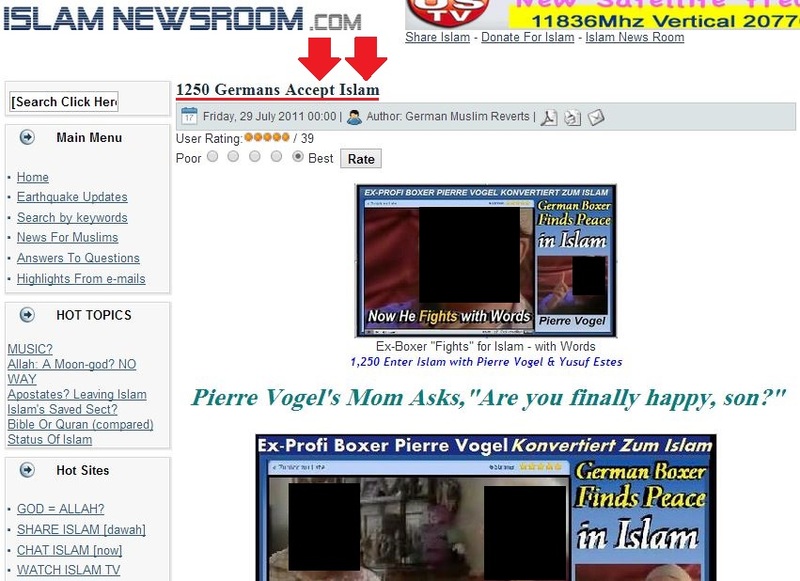 Both the host and the translator of the interview were astonished at the large number of whom they understood to be new Muslim converts in Germany. So the interview goes on, and they ask Yusuf Estes what attracted them to Islam, and he mentions the topics he talked about, without clarifying that the 1,250 were actually already Muslims who were just told to stand up and take part in a public shahadah ceremony he invented. Source: This screenshot taken December 1, 2013. Now, you all became Muslim tonight, right here! (Audience laughs) That brought my average WAY UP!! Source: How to Call to Islam [available alternatively here and here], at just after two hours into the recording. After the lecture 135 people accept Islam. But the fake report of 135 people “converting to Islam” in the Caribbean was not big enough as news. An inflated version of an account of “people standing up to take shahadah” made its way up to nearly 300 (in this video). However, a bigger attention-getter was needed, one with much bigger numbers and some white European faces to melt hearts at fundraisers all over the world. With this, the stage for Dusseldorf was set. Isn’t it about time to pay attention to what the scholars have been saying about Yusuf Estes?! Please take the time to read this clarification [PDF] about the serious errors of Yusuf Estes in basic Muslim beliefs. The legacy of dishonesty and trickery left behind in Germany is evident. We ask Allah to guide him, his German associates, and all of us to sincerity and honesty in all of our dealings. This is very serious if indeed the majority of the Dusseldorf audience was Muslims, but how do we know that? Maybe they were really mostly non-Muslims so the reports are actually true. How can we be sure? Thanks for your question, Amir. Quite simply, nobody involved in that fiasco would even suggest that other than a tiny minority were non-Muslims. Amazingly, Yusuf Estes actually takes a head count at the beginning of the lecture [! ], counting the non-Muslims as nine in number. [click here] That’s nine (9) out of 1,300, according to Yusuf Estes’ own count! Sure, there could have been a few more, but I think you get the idea when watching him count that the non-Muslims were very, very few in number. Subhaan Allah, your question has opened up an even bigger proof against this swindler. We’ve updated the PDF to include this detail. Jazaak Allaahu khayran! Assalamualaikum. I really need to apologize. 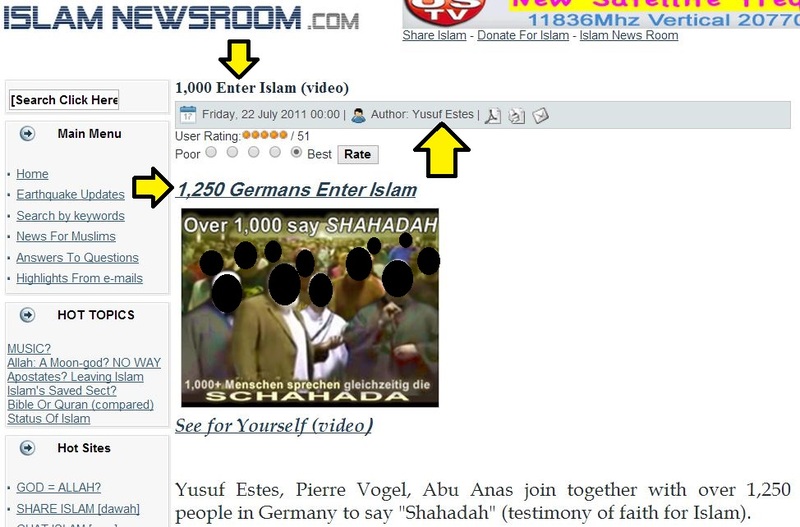 Since I first saw this website about a year ago I thought it was some political attempt to malign Yusuf Estes. I asked him privately about it and he said there was some princes in Saudi Arabia who had it in for him and Huda TV. I believed him and dismissed these allegations after that and I even posted some very negative comments here which I dont think were ever approved. Well I dont see them anyway. Anyways, I need to apologize and honestly thank you for this work. This man is not honest, and anybody who sees the evidence above has nothing to say except: I guess you were right. Did his enemies and haters make him lie and deceive the Muslims on such a huge scale?! May Allah guide him. wassalam. wa ‘alaykas-salaamu wa rahmatullaah. May Allaah bless you, dear brother. We all make mistakes, but one thing is important: If you warned against the content of this website – content which guides people away from some very serious harms in their Religion – then please do your best to rectify that. Reach out to anybody you may have turned away from the website and ask them to seek clarity from it. Explain that your previous warning was in error and be clear, and the content here is extremely important to read. Through this you would correct any wrongs you have done and earn great rewards from Allaah for calling to the correct understanding of Islaam in issues that the people need so badly. Thank you for commenting, and may Allaah give you success. Akhi Younus may Allah reward you! You reminded me about my own duty to make things right, after some of the things I said about this website before. This article and the one on plagarism puts everything in place for me. Going back and reading the content here now is a whole different experience, I feel like a magic spell has been removed. We been “bamboozled” like Malcolm X said. This man has lied to MILLIONS of people. May Allah guide him! How on God’s green earth is he still viewed as trustworthy. These are some strange times we live in. I once used to watch and listen to his lectures on youtube , but later on as I did , realise he is too good to be true .. and now after seeing and reading the facts that was brought to my attention , totally agree that he is one that was sent to deceive us ..
Is this not a le and deception. Is it not true that out of the 1250 people around 95% were already muslims and they just said their shahadah as if in a public ceremony. Could you confirm how many of those 1250 people were ACTUALLY not muslims and REVERTED to Islam.